Clarity Facial Moisturiser is a rich, clearing facial moisturiser dedicated to the treatment of oily skin. Its aim is to treat problems such as unbalanced skin, blemishes, inflammation and dull complexions, while providing the essential ingredients required for optimal cell renewal and regeneration. A light, moisturising non-oily lotion that sinks into the skin to provide lightweight hydration and oil control while helping to prevent blemishes with regular use. 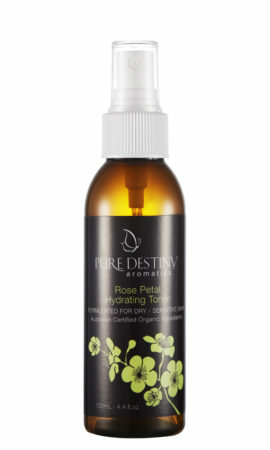 Cleanse beforehand with Pure Destiny Purifying Foaming Cleanser or and follow with Lavender Flower or Which-hazel Toner. A luxurious, cream rich in nourishing Olive Oil polyphenols and antioxidants. Essential Oils: Rosemary, Petitgrain, Sage, German Chamomile. Oily to Combination Skin Moisturiser. Ingredients: Aqua (Water), Vegetable Emulsifying Wax, Almond Oil, Vegetable Glycerine, Organic Sesamium Indicium (Sesame) Oil, 100% Pure Essential Oils of Rosmarinus officinalis (Rosemary) Citrus aurantum (Petitgrain), Matricaria chamomilla (German Chamomile),Organic Butyrospermum Parkii (Shea Butter) Centella asiatica (CentellaExtract Oil), Organic Cannabis sativa (Hemp Seed Oil), Organic Cacao (Cocoa)Seed Butter, Organic Rosa rubinginosa (Rosehip Oil), Organic Calendula officinalis (Calendula Oil), Borage Oil (Borago officinalis) Tocopheryl Acetate, Vitamin A Palmitate, Cetyl Alcohol ,Citrus paradisi (Grapefruit Seed Extract).